Photo courtesy of Ron Rogos: Club President Chuck Reavis presents Paul Harris Fellow certificate to Kaen Schaufeld while John and Peggy Rust applaud. 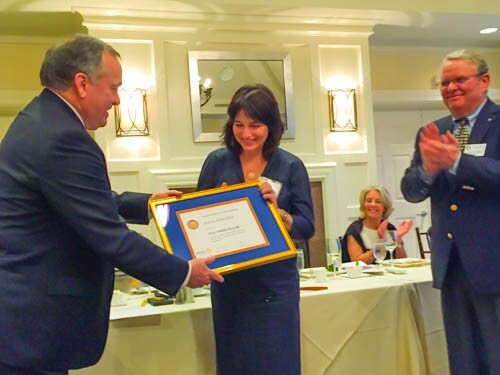 Karen Schaufeld was honored as a Paul Harris Fellow by the Rotary Club of Leesburg. Karen is the founder of 100 Women Strong and All Ages Read Together (AART), two successful non-profits serving Loudoun County. She is on numerous boards and is an author of children's books, including The Lollipop Tree. Karen was the perfect choice to receive this honor for her humanitarian efforts. She was selected from a pool of impressive candidates presented by Club Foundation Chair Chris Fristad. Her passion and work for improving local and international education, healthcare, poverty and peace match Rotary's mission. Karen shared that she had a connection to Rotary early in her career when she presented to a New England club and realized the power of Rotarians to get things done. Karen's family attended the presentation at the club on April 2, 2015, and joined the club members in a standing ovation. The first Paul Harris Fellows recognitions were received by Rotarians in 1937-38. Mother Teresa was the first non-Rotarian recipient in 1980. Others include entertainer Pearl Bailey, U.S. President Jimmy Carter, Russian President Boris Yeltsin, U.S. astronaut James Lovell, UN Secretary-General Javier Perez de Cuellar, and Jonas Salk. The Fellowship is tied to the Rotary Foundation, and the most notable current global project of the Foundation is to End Polio Now.